My main characters have been Horde for quite some time, but this week I decided to change things up on my priest. It’s a bit disorienting to faction change after playing one faction for so long. So far I haven’t flown into the wrong Shrine, but I know my day is coming. While my faction change processed, I passed the time thinking about how much of a butthead Garrosh is. And what about the Alliance’s arrival in Pandaria? I wanted to experience it. Well, Blizzard had me covered. As soon as I made my way to Stormwind, I received the quest to head out to Pandaria on the Skyfire. After zoning into Pandaria, I immediately fell to my death because the Skyfire disappeared from under me. I assumed my quest had ended there because I’d already been introduced to Pandaria through the opposite faction. My slight OCD for quest completion pushed me to visit Wowhead, where I discovered that I could complete the Alliance-side starter quests after all. Woo! Taradormi, a Keepers of Time NPC, is stationed at Lion’s Landing for our time travel needs. 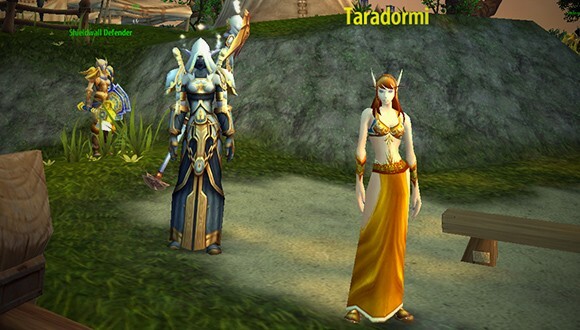 After being informed that my timeline in Pandaria was incomplete, Taradormi offered up a second chance to experience the Alliance arrival. Accepting her offer will change your character’s phasing with a buff while you complete the entire starting chain. And if at any time you want to return to “present day,” Taradormi will be in Paw’don Village in The Jade Forest to send you back. I’m glad the devs included this little workaround for those of us who enjoy the story side of WoW.